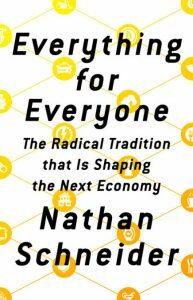 Schneider is author of Everything for Everyone: The Radical Tradition That Is Shaping the Next Economy, published this week by Nation Books. Schneider said today: “The financial crisis that many are remembering this month with the 10-year anniversary of the Lehman Brothers bankruptcy on Sept. 15, was a crisis of accountability. In the service of its investor owners, the financial industry was willing to sacrifice millions of people’s homes and jobs for profits. In the years since, there’s been a revival in another kind of business, showing how it has already shaped our world and could provide a real alternative to Wall Street. “Cooperatives are businesses owned by and accountable to their participants — ranging from small grocery stores to Cabot Creamery and Organic Valley, from Ace Hardware to the Associated Press. There’s a new generation bringing this legacy into the 21st century, building co-ops out of Bitcoin and low-wage care-work, challenging the likes of Uber and the coal industry, as electric co-ops are doing. Schneider is also a professor of media studies at the University of Colorado Boulder.